“MagicPot+” is a visuo-haptic system for displaying var- ious shapes which have curve, edge, and inclined surfaces, using a simple transmutative physical device and the effect of visuo-haptic interaction. 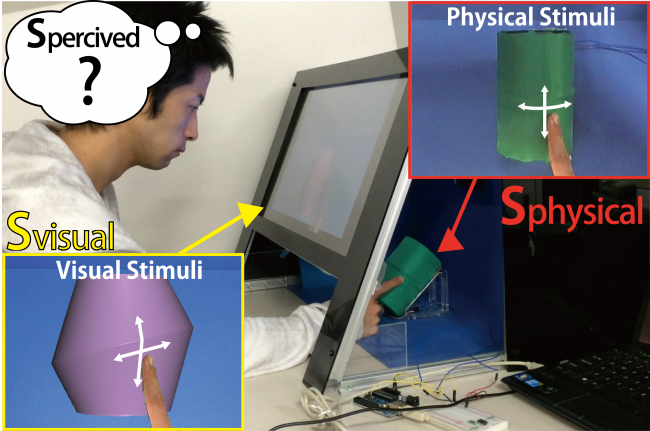 We aim to construct a perception-based shape display system to provide users with the sensation of touching virtual objects of varying shapes using only a simple mechanism. We have confirmed that the perception of each primitive shape such as curvature and angle could be modified by displacing a user’s hand image on the monitor as if s/he were touching the visual shape while actually touching another shape. In this study, we constructed the method to merge these findings for displaying more various shapes, including angular ones. We built a transmutative device, which the user touches. The device does not undergo significant transformation, but its surface can be slightly bumped in and out, and dis- played various shapes with various angles, length and curvature. The results of experimental trials confirmed that our method for displaying each primitive shape can also worked as designed when we combine these findings to display more complex objects using this device which transforms slightly. Yuki Ban, Takuji Narumi, Tomohiro Tanikawa, Michitaka Hirose. “Displaying shapes with various types of surfaces using visuo-haptic interaction.” Proceedings of the 20th ACM Symposium on Virtual Reality Software and Technology. ACM, Nov. 2014.